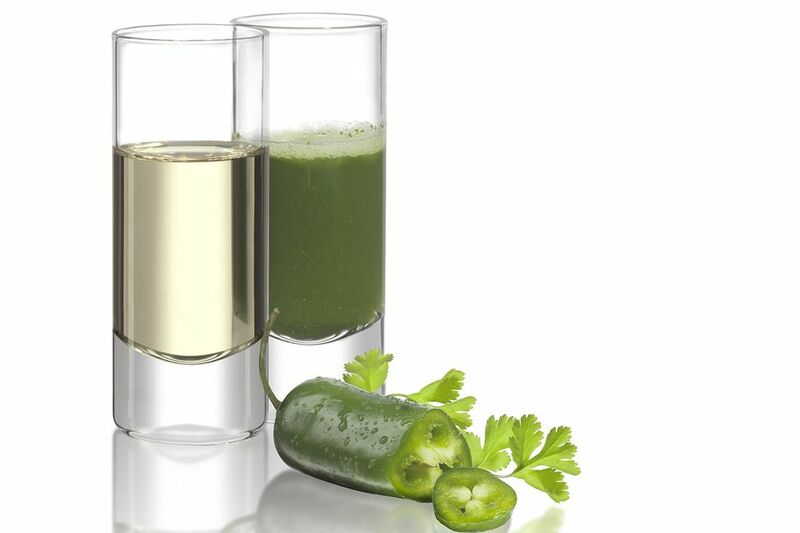 What's not to love about a tequila shot that includes pineapple, mint, cilantro, and jalapeño? That's exactly what you'll find in el vocho. The recipe puts a flavorful twist on the popular sangrita, offering a great spicy kick that's sure to get your attention. This two-part shooter begins with a tasty shot of Milagro Reposado Tequila, which you should find to be very smooth. Though this tequila may not require a chaser, the second stage of el vocho is so interesting that it is hard to pass up. In the second glass, you'll find pineapple juice spiced with cilantro, mint, and jalapeño and it makes for a fantastic follow-up. According to Milagro, the name "El Vocho" is taken from the VW taxis that dash about Mexico City in their white and green colored rush. Combine the pineapple juice, cilantro and mint leaves, and pepper slices in a blender. Blend well and pour 1 1/2 ounces into a shot glass. Pour the tequila into another shot glass. Serve and enjoy, drinking the shot of tequila followed by the chaser! It's actually easier (and more worthwhile) to make more than one serving of the pineapple mixture at a time. Also, the herbs and pepper are flavorful enough to handle a larger volume of pineapple juice. For this reason, the chaser is designed to make two 1 1/2-ounce servings. Make even more at once if you like. Store any leftover chaser in the refrigerator for no more than one day. It's best in a sealed glass jar; it may be difficult to remove the herb/pepper aroma and flavor from a more porous container like plastic. Wash your blender pitcher out very well as soon as possible. Pour this shot with a blanco or even añejo tequila if you prefer. There's no need to actually shoot this drink if you don't want to. It's an interesting experience when taken slowly as small sips—one of tequila and one of the chaser. If you don't like cilantro (some people find that it tastes like soap), try another green leafy herb instead. Basil and oregano will each offer a nice herbal background to the mint and pepper without cilantro's distinct taste. How Strong Is an El Vocho Shot? In theory, if you were going to mix the tequila with the chaser, you would be cutting the strength of the tequila in half. That would make the 80-proof Milagro Reposado a 40-proof (20 percent ABV) shot. However, you're actually just giving your stomach a buffer to the alcohol (and a spicy one at that). This can slow down the effects of the tequila, but if you drink one too many rounds, you'll be on the road to a pretty nasty hangover (and potential upset stomach).